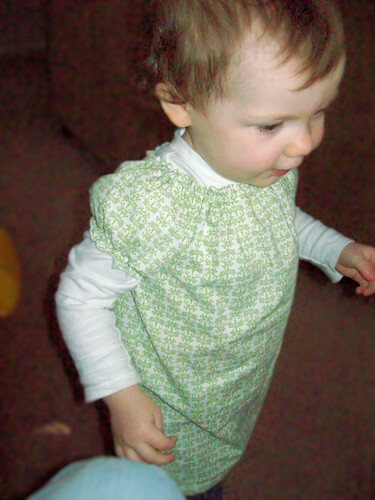 I can’t say it enough: these shirts are so easy and quick to make! Thanks so much to this tutorial (that I found via Craftster) from Just Tutes. I tried some of the different techniques she suggested this time. 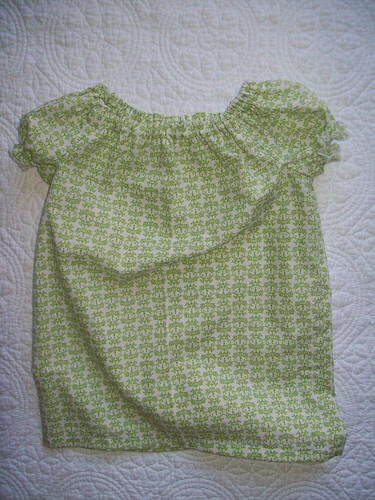 I shirred the sleeves and put the elastic casing on the neck lower to make it more ruffled. I like it. I highly recommend this pattern. (I tried and tried to get a decent picture with her wearing it, but she doesn’t seem to want to slow down much now a days. Oh…to have her energy).